I’m happy to inform that I received a letter from the ambassador of Portugal acknowledging the receipt of my book, “Culture Wise INDIA,” and promising all help in starting Portuguese language course in Daman! The ambassador of Portugal came on a one-day (unofficial) visit to Daman along with the Goa-based Consul General on the 12th of November 09. Though I couldn’t meet them, I was able to get my letter, requesting their intercession for starting Portuguese language classes in Daman, delivered. My well-connected, UK-based friend and fellow Damanense, Victor Fernandes, gave both, a moral boost and a real boost to the project by forwarding the letter to the University of Aveiro, the Associativismo Sem Fronteiras das Comunidades Portuguesas, the Ministry of External Affairs and a prominent social worker in Portugal. I take this opportunity to present you a copy of my first book, Culture Wise INDIA: The Essential Guide to Culture, Customs & Business Etiquette (Survival Books, UK) which was released on Amazon in May but most important for me, the first copy debuted in Portugal on 18th July 2009 and found itself in the hands of my long-time friend and mentor, Dr. Adelino Rodrigues da Costa (chief of Fundação Oriente – Goa). I have mixed feelings – I wanted so much for my first book to be on the topic closest to my heart – Damão! However, the book does something for Damão because it gives Damão its first book author. Loyal as I am to Goa, Daman & Diu, I mentioned in my book how and why the culture in this former Portuguese colony is different from the rest of India. But no two fingers are alike and so it is with siblings. These cultural differences though subtle, lend Damão its uniqueness, giving its people an identity of their own – the Damanense! This is the premise and essence of my forthcoming book, Viva Damão! The Indo Portuguese Subculture of Daman. I’d like to mention here, with gratitude, that Viva Damão and three others in the series, have their genesis in one of my Blog2Book projects launched by the late Pedro Cabral Adão, former Consul General of Portugal at the commemorative function of National Day of Portugal, of Camões and of the Portuguese Community, in Daman on the 10th of June 2006. Like my fellow Damanenses, I’m proud of my Portuguese heritage – the forts, the churches, the architecture, etc. – but what are these without culture? Our fort may not have made it into the elite Seven Wonders of the Portuguese World but it is culture that breathes life into monuments. And the Indo Portuguese culture of Damão is by far more Portuguese than that of Goa and Diu and thrives without sponsored efforts of any institution. But there’s more… our culture has spilled over to foreign shores, the UK in particular, and thrives there too. British community leaders are frequent observers at our social and cultural events, especially in Leicester and Peterborough where the concentration of Damanenses is densest – adaption is not on their agenda; they have adoption in mind! The worldwide success of World Daman Day 2008 & 2009 bear testimony to that. But of all the cultural facets – art, religion, tradition, custom, language, music, cuisine, architecture and attire – language is not just the binding glue that holds it all together, it is the conduit through which culture is propagated. In this regard, I’m proud to say that of all the erstwhile Portuguese colonies in Asia, only Damão can boast that five decades after the Portuguese left, the mother tongue – a Lingua Mãe – of every newborn Catholic Damanense continues to be Portuguese, albeit as a dialect. Not only that – migrant traders from neighbouring states begin speaking the language in just 2-3 years, picking it up in their day-to-day interactions with Damanense customers! Can you say this of Goa and Diu or even Macau? 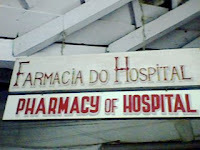 50-year old Portuguese sign board still in use! You’d think the above picture of a sign board was taken from a local museum! The photo was taken with a mobile phone in January 2009 when I visited a colleague in the Primary Health Centre (PHC), Fort, Big Daman. Whoever says that the Portuguese language is on the decline in Daman, is certainly not living in Daman – this sign board is being used by a government establishment! https://noelgama.com/wp-content/uploads/2017/03/winner.jpg 0 0 Noel Gama https://noelgama.com/wp-content/uploads/2017/03/winner.jpg Noel Gama2009-07-28 17:02:002009-07-28 17:02:0050-year old Portuguese sign board still in use! Call the chilli by any other name!! Portuguese-based Creole of Damao came closest to Standard Portuguese in the seven years or so preceding the liberation in 1961 during the time the Portuguese troops camped in Daman. This is also the period when the Indo-Portuguese culture leaned more on the European side, again, as a result of the influence of the troops and their families. Further, this happened more in Small Daman than Big Daman as most of the troops and their families lived there. Also, almost all of the elite of Damanense society lived in Small Daman. It was the elite of that time that interacted most with the ‘White’ officers and their families. Hence the slight difference in the Portuguese of Small Daman and Big Daman. When the Portuguese left in 1961, there was an exodus of the locals too, mostly from Small Daman when most of the elite left. Big Daman became the new seat of Indo-Portuguese culture by default – it had more catholics and it’s original creole and Indo-Portuguese culture was not affected much during the last seven years of the Portuguese as Small Daman was. But the language is certainly not dying despite the convent school discontinuing Portuguese as a second language and more and more Goan priests who do not know the language being posted in Daman not to mention the large numbers of south Indian Christians in Small Daman. The number of people speaking Portuguese as their mother tongue may be declining for the simple reason that they’re migrating to the UK and definitely not because they’re switching to another language as has happened in other parts of India where P’guese based creole was spoken. Not only that – quite a few traders/shop-keepers in Big Daman who migrated to Daman (Rajashtanis being the most prominent) as recently as five years ago, speak Portuguese with their Portuguese-speaking customers! Well, for good or for bad, Damanense Portuguese says it best – people feel they heard a ‘real’ mass when it’s said in P’guese and nothing could give them more satisfaction than using a P’guese swear word… the English SOB is a sob before it’s P’guese translation. And there’s a variation that was used by the Pguese to name a local chilli!! https://noelgama.com/wp-content/uploads/2017/03/winner.jpg 0 0 Noel Gama https://noelgama.com/wp-content/uploads/2017/03/winner.jpg Noel Gama2008-12-04 13:23:002008-12-04 13:23:00Call the chilli by any other name!! The topic about the Portuguese language spoken in Daman by Damanenses is very popular on the forums. https://noelgama.com/wp-content/uploads/2017/03/winner.jpg 0 0 Noel Gama https://noelgama.com/wp-content/uploads/2017/03/winner.jpg Noel Gama2008-12-02 13:32:002008-12-02 13:32:00Eu Falo Português!